Full tree services - trimming, pruning, removal, planting, stump grinding - Lake Arrowhead to Big Bear"
Tree limbs and branches too close to your chimney, or rubbing against the house? Need some new trees or want to get rid of some? Need to let more sun into a garden area? VB Landscaping offers full Tree and Shrub Services, including fertilization, trimming, pruning, removal, stump grinding and removal, tree planting and re-planting. TREE PRUNING - High-quality, expert tree pruning is our bailiwick. Pruning, provided by our trained experts, improves the health and appearance of trees, prolonging their useful life by removing undesirable branches, whether they are dead, weakened, diseased or insect-infested. TREE AND SHRUB FERTILIZATION - Well-nourished trees and shrubs have better resistance to disease, insect attack and drought. Fertilizer can help keep your trees and shrubs healthier, promoting the luxurious foliage that adds beauty and value to your property. CABLING AND BRACING - Cabling involves installing steel cables between major limbs to reduce strain, support the tree, and reduce stress damage from high winds and excess ice or snow weight. 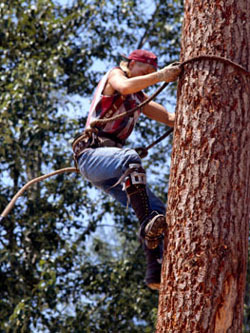 For large, weak, or split crotches, bracing is used to give direct support and reduce twisting strain on the tree. A metal rod is inserted through the crotch and cables are placed above it. TREE AND SHRUB PLANTING - Having the right tree or shrub in the right place can make a big difference in the beauty and value of your property. We can help determine what tree species will best compliment your property and withstand the stress of your local environment. We can also move or transplant trees. REMOVALS AND STUMP GRINDING - Sometimes a tree's problems are so advanced that it can't be treated and, as we all know, up here on our mountain, bark beetles are devastating. When a tree becomes a hazard, it is best to remove it and eliminate all safety and liability concerns. Let our professionals take care of that for you. SHRUB PRUNING - Proper pruning improves the health and appearance of shrubs and prolongs their useful life by removing undesirable or dead, weakened, diseased or insect-infested branches.